Soak up the bustling energy of Greenville SC on this sightseeing Segway tour. 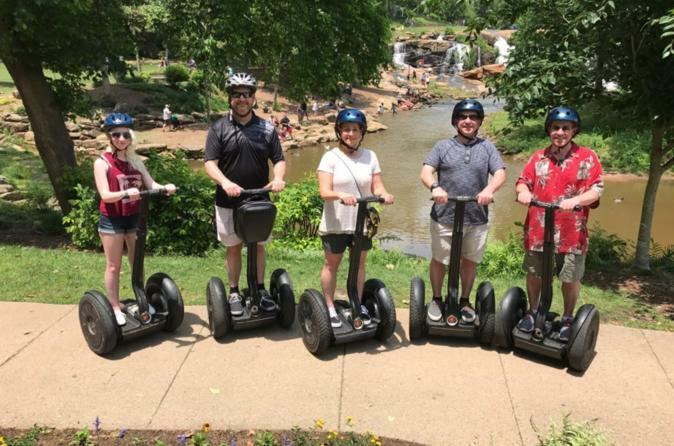 As one of South Carolina’s fastest-growing urban areas located in the foothills of the Appalachian Mountains, Greenville is a wonderful city to explore by Segway. Glide through downtown Greenville to the historic West End and then cruise along the scenic Swamp Rabbit trail. Choose from several departure times, including a sunset tour. Meet in downtown Greenville SC at your selected departure time to receive a 20-minute safety orientation from your guide. Once you feel comfortable on your Segway, head out through downtown to the historic West End. As you travel through these buzzing areas, you’ll come to understand why Greenville is noted as the fastest-growing urban area in the state and was voted one of the ‘Top 10 Fastest Growing Cities in the US’ by CNN Money. From here, venture to the Swamp Rabbit trail to experience a different side of Greenville. This 18-mile (29-km) multi-use trail system runs along the Reedy River and connects Greenville County with schools, parks and local businesses. As your guide will explain, this trail follows the bed of a former railroad nicknamed after the indigenous swamp rabbit. Admire your lovely natural surroundings and pause to stretch your legs and take some photos. If you have a special request on sights you’d like to see, simply let your guide know -- this tour is easily tailored to your group’s needs and desires. At the end of your tour, make your way back to downtown Greenville.